We are committed to protecting the privacy of our clients. All personal information provided to us will remain totally confidential; it will not be sold, rented, traded or shared. We use the information you provide only to complete your request. This information is required in order to contact you about your travel plans, quotes and to complete your travel reservations and documents. We do not share this information with outside parties except to the extent it is necessary to complete your reservation. 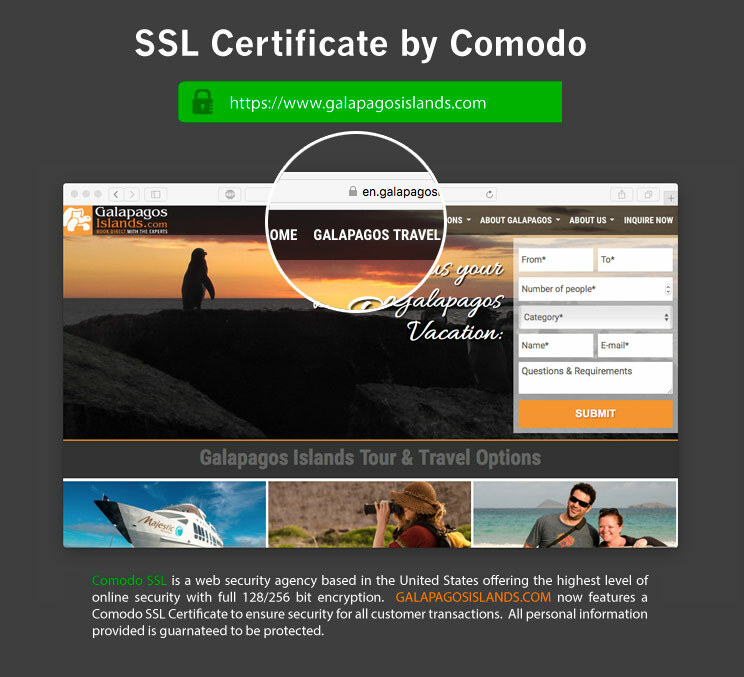 By providing your email address in the LeadQuizzes form you visited, you agree to receive automatic emails by Galapagos Travel Center. You can unsubscribe at any time through the unsubscribe link included in every email. We respect your privacy and will never share your information with any third parties. A deposit of 30% total invoiced for your trip is required to confirm your reservation. The remaining balance (70%) is required 60 days prior to the departure date. In cases of trips confirmed within 60 days of the departure date, payment in full is required for confirmation. You should receive confirmations with every payment you make. Your trip advisor should also send you a pre-trip information pack containing useful information to help prepare you for your trip including details of arrival in Ecuador, who will meet you, transfers to hotel, climate, currency, electricity, and more. IMPORTANT NOTE: Payment policies regarding cruises may change according to each boat operator, please contact your trip advisor or write us at [email protected] for specific cruise polices. For cancelations of 120+ days before cruise departure date, the full amount minus a cancelation fee of 10% will be refunded to the client. For cancelations between 60-120 days before cruise departure date, a cancelation fee equal to the deposit paid will be charged. For cancelations less than 60 days prior to the cruise departure date, full amount of the cruise is charged with no refund. Cancellation penalties for Land Services that involve guide, hotel or third parties reservations will be evaluated depending on the policy of each service provider. TRIP CANCELATION INSURANCE: Galapagos Islands.com recommends looking at options for trip cancelation insurance. If you have questions about such insurance please contact a trip advisor who can assist you in deciding on the right provider. IMPORTANT NOTE: Cancelation policies regarding cruises may change according to each boat operator, please contact your trip advisor or write us at [email protected] for specific cruise polices. For our policies concerning refunds, cancellations and tour replacements please click here. Travel agents, their Owners, Outfitters, Agents, and Employees generally only act as the agent for the owners, contractors, and suppliers providing means of transportation and/or all other related travel services and generally assume no responsibility caused for injury, loss or damage to person or property in connection with any service resulting directly from: acts of God, detention, annoyance, delays, expenses arising from quarantine, strikes, thefts, pilferage, force majeure, failure of any means of conveyance to arrive or depart as scheduled, civil disturbances, terrorism, government restrictions or regulations, and discrepancies or changes in transit or hotel services over which they have no control. Reasonable changes in the itinerary may be made where deemed advisable for the comfort and well-being of the passengers and according to the Galapagos National Park regulations. The right is normally reserved to substitute boats for others going out on the same date with equivalent or higher class, alter the itinerary, and reverse the order of the places to be visited. On advancement of a deposit to an agent, the depositor therefore agrees to be bound by the above terms and conditions.